The most suitable mattress for me? What kind of mattress to choose? Memory, independent springs or latex? There are now thousands of models on the market, different not only for vehicles but for height, material, fabric and padding. Some of these mattresses, maybe different from each other, may give the same benefits and sensations, what varies is the yield over time of the mattress. A good mattress should adapt to your body day after day, retaining its own characteristics and elasticity as long as possible. Among the main materials: Memory Foam translated "foam" (foam) with a "memory" that is, who has the memory of our form, technical name of Viscoelastic Memory. What is the difference between pocket sprung mattresses and mattresses traditional spring, that is, with Bonnel spring system? The difference between memory and latex? What is the best? It 'a recurring question, the choice is subjective, but we understand the differences. The memory is a synthetic rubber evolved, nothing plays that already exists in nature, is self-molded to the body, designed in the military, first jobs: on the space shuttle seats of NASA, to relieve the momentum of the shuttle. 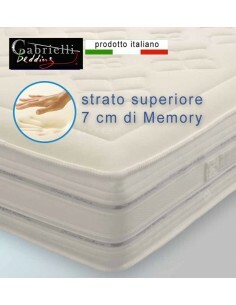 In a cheap mattress "his slow memory" could be short-lived and lose its customization features. It takes the form of the body by reacting with weight and body heat while the latex returns an upward thrust. The 100% natural latex or latex, must be of excellent quality foam as Pirelli or Ennerev products to avoid running into the latex specimen, which at first are good, but the yield over time will be different. Like springs, with time also these mattresses tend to lose elasticity. That density must have the memory? The density that needs to have the memory foam (called by many Memory form) depends not only on the Memory quality, but also on the height of the slab. If the Memory slab is 6 cm the density must be 50 or 55 / m3. In a Topper Memory (checker mattress cover) 6 cm must have this density, the lower is preferable if a higher density. If the person has a body weight "important" (over 100 kg) the average density Memory can not give him the same feelings and benefits, then the Memory HD at 95 / m3 is recommended to "extra weight"